Sterling, CO is located on the high plains of northeastern, Colorado! Sterling is a rural community of 15,000, founded rich in agricultural tradition. Sterling Regional MedCenter is a 36-bed, Level III trauma facility with 4 large operating rooms and health and wellness services with a total service area of over 45,000. 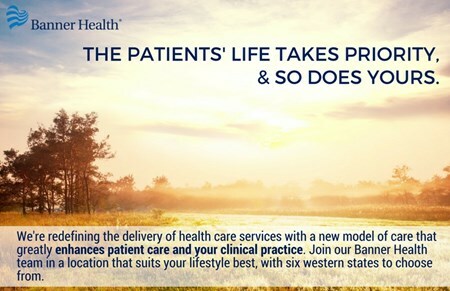 • Banner's multi-specialty clinic is located adjacent to the hospital. • Private & public Golf Courses. • Over 60 acres of parks. • Indoor & outdoor movie theatres. • Three reservoirs, two with unlimited water sports. • Hunting, camping & fishing. • A highly respected and rated school district with ACT scores that exceed state and national averages. • Two hours to metropolitan amenities! Denver offers major league sports, theatres, a zoo, major shopping malls, museums and more.